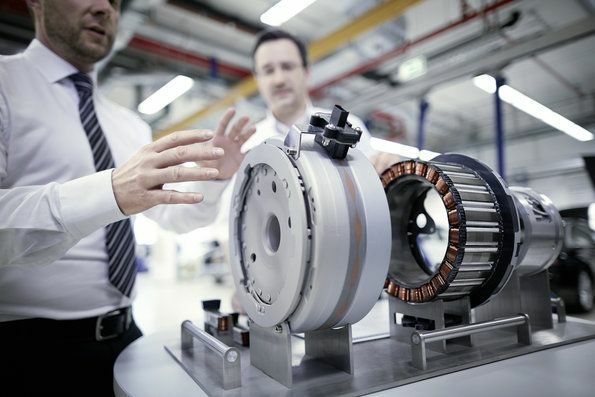 Audi engineers in the lecture hall: At the Technical University of Ingolstadt (THI), powertrain development engineers from Audi are expanding their knowledge in the field of electric mobility. The goal of the project is to increase their strategic and technical expertise. The company intends to further strengthen its innovative power by gaining additional stimulus from the world of science. Technical and educational experts of AUDI AG have designed the professional course of training together with professors from the THI – tailored to the company’s requirements. Phases of classroom teaching and self learning will alternate over a period of three and a half months. The timetable includes modules such as “Electrical Machines and Power Electronics” or “Concepts for Electrified Vehicles and Energy Storage”. The first participants from the Powertrain Development department will complete their further training in January 2017. The Audi Academy is supporting the project as the company’s own training partner. It works continually with the individual technical departments on their employees’ training and qualifications in all key areas of the future. “The automotive industry is in a phase of transformation,” emphasized Thomas Sigi, Board of Management Member for Human Resources at AUDI AG. The cooperation with the THI in the field of electric mobility serves as a model. Assuming that the project runs successfully, similar programs for employees from the entire company will follow. Audi has cooperated with the THI since 2004, for example in the context of endowed professorships and dual courses of study.